You can prepare this tofu spring rolls with store bought fried tofu to make it more easier or grilled extra firm tofu and also you can use season fried bean curd ( normally use for Inarizushi ) just slice them and ready to use for any cold spring rolls. 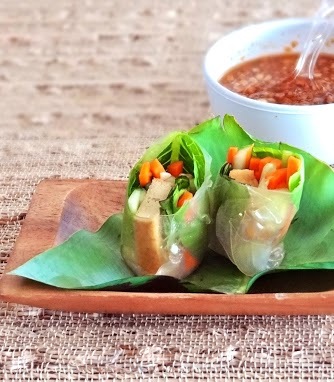 I made this cold tofu spring rolls so often, I brings to potluck or party, one of all my friends favorite especially my homemade peanut sauce to serve with this cold spring rolls. roll one time and fold them both side and continue to roll very tight. Now those are some beautiful spring-rolls. I love how you have them plated... very inviting. :) Your peanut sauce looks delicious. I bet they were a fantastic treat. Well done. Have a Merry Christmas! I have never made this before, simply I am afraid of rolling the stuffing into the rolls but you sure have done a great one. This is so healthy and I can like just have a few for my dinner. Btw, I will be heading to Vietnam in Feb and hopefully I can take some there. I am not sure whether you will be on blogging as Christmas is around the corner, so Merry Christmas and have a wonderful time. Oh, I love spring rolls...can you drop a few in the mail to me ;) Hope you have a fabulous holiday season, my friend...it's been wonderful visiting you and your blog this year! I love summer rolls, they're so delicious with all of the vegetables. Plus, they're completely addicting - you can't just stop at one! Oh my I am your newest follower and I am in love with this recipe, delicious, going to browse around some, stop by and visit me when you get a chance. Happy Holidays! What a beautiful dish! They look delicious and the dipping sauce....*sigh* I could eat it like a bowl of soup! first time in your space....the tofu springrolls looks delicious...so is the peanut sauce :-) I'm ur new follower....do viist my space sometime ! wishing u n ur family merry christmas ! Looks delicious, Ridwan! I would probably tear the rice paper and make a Jude mess, lol!